The duckbill platypus is an impossible-looking, risible creature that we don’t typically associate with horrific pain. In fact, besides its odd looks, its greatest claim to fame is that it’s a mammal that lays eggs. But that’s just because you’re not paying close enough attention. On the hind legs of the male platypus are two spurs that inject a venom so painful, the recipient human writhes for weeks after the encounter. In spite of the fact that platypuses (platypi?) and humans don’t hang out together much, platypus venom contains a specific peptide–a short protein strand–that can directly bind to receptors on our nerve cells that then send signals of screeching pain to our brains. Ouch. If you’ve ever experienced platypus-level pain and taken pain killers for it, you know that they have…well…side effects. It’s because they affect more than the pain pathways of the body. The search for pharmaceuticals that target only the pain pathway–and, unlike platypus venom, inhibit it–forms a large part of the “rational design” approach to drug development. In other words, you rationally try to design things that target only the pathway of interest. In this case, researchers reached for the scorpion. Their decision has precedent. In ancient Chinese medical practice, scorpion venom has been used as a pain reliever, or analgesic. But as developed as the culture was, the ancient Chinese didn’t have modern protein analysis techniques to identify the very proteins that bind only to the pain receptors and inhibit their activity. Now, a team from Israel is doing exactly that: teasing apart the various proteins in scorpion venom and testing their ability to bind pain receptors in human nerve cells. With proteins in-hand, the next step will be to create a synthetic mimic that influences only the receptors of interest. It’s a brave new world out there, one where we wrestle proteins from scorpion venom and then make copycat molecules to ease our pain. Why do you think the platypus makes proteins in its venom that human pain receptors can recognize if humans generally haven’t targeted platypuses (platypi?) as prey over its evolution? In the human body, a receptor may be able to bind each of two closely related molecules–as a hormone receptor does with closely related hormones–but one of the molecules activates the receptor, while the other molecule inhibits it. Taking this as a starting point, why do you think some proteins in scorpion venom–which often causes intense pain–have the potential effect of alleviating pain? Since their introduction into the Australian landscape many decades ago, cane toads have devastated local flora and fauna. The idea was that they would eat the cane beetle, which threatened sugar cane crops. As it turned out, the thousands of introduced toads had little effect on the cane beetle, but they killed or ate just about everything else they came near. Naturally, ever since then, Australians have tried to find ways to rid themselves of these self-introduced pests, which kill pets, swarm over the landscape in such numbers they look like a moving, toady carpet, and outcompete many Australian natives for food–or, they just eat them. Recent news from Australia was that cane toad hunters might no longer be able to humanely dispatch the amphibians using carbon dioxide gas. Instead, the advice was going to be that bashing them over the head with a single, toad-dispatching blow would be the best way to control them. Now, some Australians have discovered another way to end a toad’s life: Death by meat-eating ant. Evidently, the ant does not find the toad naturally attractive, but a spoon of cat food near areas where baby toads emerge from ponds brings the ants by the horde. The horde then finds a lot of tasty toads to eat, and…they eat them. Sounds painful, but evidently, it’s pretty effective, and no human has to bash a toad on the head. The Australian researcher who made the cat food breakthrough is Rick Shine, a noted herpetologist whose recent research on behalf of native herps turned up this low-tech solution to the problem. 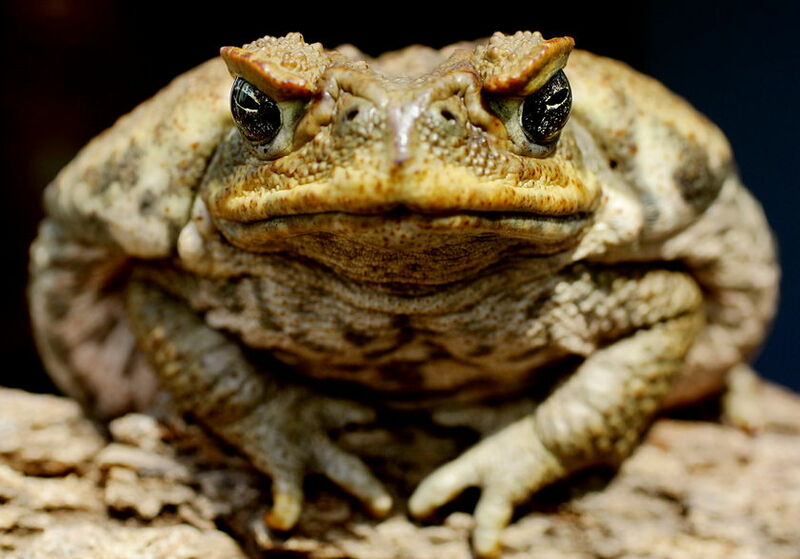 Introducing the cane toads ended disastrously for Australia. Find other examples of introduced species. Why is it that populations of introduced species seem so easily able to explode in number? Think about concepts of co-evolution and species interactions. In Austin, Tex., an invasive plant species, Hydrilla, has choked lakes and water treatment plants. Authorities are trying to control Hydrilla by introducing triploid Asian grass carp, another non-native species. What are the grass carp expected to achieve? Why? Why are they triploid? Can you think of benefits of this second introduction? What are some potential drawbacks, and what might be the first sign that they’re in progress? And where did that Hydrilla come from, anyway? People can’t do it. When we drink, alcohol impairs all kinds of functions, including our ability to drive or walk a straight line. Bat researchers in work published in the online open-access journal PLoS ONE hypothesized that the same rule would apply to bats: the frugivorous (fruit-eating) types often encounter fermented fruits, meaning that frequently, a meal for a bat comes with the alcohol equivalent of a dry martini. And the humans–not for the last time–were wrong. Bats flying under the influence of a blood alcohol measuring three times the human legal limit maneuvered just fine in their human-imposed drunk tests. The test consisted of plastic chains suspended from the ceiling, requiring the bats to make their way around and through without a collision. Whether they’d imbibed sugar water or grain alcohol, the world’s only flying mammals performed equally well. Not all bat species have this capacity. It seems that bats, like people, may vary in their alcohol tolerance. In addition, bat species like the New World bats in this study that encounter fermented fruits all the time may have a better tolerance for alcohol than bats who imbibe only occasionally. Old World bats, it appears, are less able to hold their liquor compared to their New World, daily imbibing cousins. Alcohol: a previously unidentified force of natural selection? Humans may have long been aware that alcohol can drive certain choices. And now, the bats may confirm that. According to the study authors, sensitivity to ethanol may have determined which bat species developed where. Just as types of fruit may have influenced the speciation of bats, the bat ability to tolerate–or not–ethanol may also have affected bat adaptive radiation. Bats navigate by sonar, while humans rely primarily on inputs including vision to maintain balance and walk a straight line. Do you think that this difference might help explain why these New World bats don’t show the effects of alcohol in their navigation? Why or why not? The paper refers to the bat “adaptive radiation.” What is an adaptive radiation, and what are the conditions that are required for one to occur? How did bat speciation exemplify this process? Other frugivorous or omnivorous species encounter fermented foods, as well. One hypothesis, the Drunken Monkey hypothesis, is that the smell of fermenting fruit drove primate evolution. Can you find other research describing the influence of ethanol on animals? Autism and oxytocin: facilitating social interaction? Oxytocin is a peptide hormone the brain produces in the posterior pituitary. It appears to play many roles in our lives, starting with birth, when it manifests one of the few examples of positive feedback during labor: The more you make, the more you make, until the uterus, the most powerful muscle in the body, contracts sufficiently and frequently enough to push a baby out of an area through which you’d think no baby could fit. In fact, in many childbirths, a synthetic form of oxytocin is used to facilitate labor. Following the birth experience, oxytocin works further magic by facilitating the mother-child bond. Oxytocin doesn’t stop there, however. It also appears to function in facilitating trust among adults. One study found that a whiff of the hormone caused study participants to be more likely to continue in their trusting behavior, even if the target of their trust had betrayed them. Autism is a term that describes a broad spectrum of developmental manifestations that can include problems with verbal communication, social interaction, and motor skills. Some research has indicated that people with autism may have comparatively low levels of oxytocin, which has led to the hypothesis that boosting these levels might facilitate a greater social understanding for them. A recent study from France published in the Proceedings of the National Academy of Sciences appears to bear out this idea. Caveats include the fact that while it was a controlled clinical trial, the study involved only 13 autistic people who had been diagnosed either with high-functioning autism (HFA) or Asperger’s (and 13 age-matched non-autistic participants). The low number of participants and the mix of diagnoses (there is controversy about the overlap or equivalency of HFA vs. Asperger’s) mean that these findings qualify as suggestive only. In addition, the authors in their paper offer some assumptions about autism that do not necessarily apply or apply in equal measure among all autistic people. With those caveats in mind, the study findings remain intriguing. The autistic participants exhibited a greater awareness of social dynamics after exposure to oxytocin, in addition to also having higher measured levels of the hormone in their blood. Oxytocin, like most hormones, does not persist for long, and these effects would be expected to be only transient. Is it direct improvement of social function or diminished social anxiety? Among the assumptions the paper authors make about autism, one is that autistic people do not engage in eye contact and that this indicates a lack of social engagement. Another assumption is that the autistic participants were unable to understand the social dynamics without oxytocin because of a social incapacity. Other studies, however, suggest a relationship between increased oxytocin and reduced social anxiety. Social anxiety can be a paramount manifestation in autism, and social phobias in general translate into an apparent inability to socialize. So the question that remains is, Did the oxytocin in this study somehow directly affect social capacity in these participants, or did it lower their social anxiety sufficiently enough that they could more comfortably engage in social interpretation? The brain releases oxytocin from the posterior pituitary. Can you identify the feedback pathway that causes this release? What other hormone or hormones does the posterior pituitary release? What about the anterior pituitary? Oxytocin is involved in parent-child bonding. Were you aware that this “natural” bond has a hormone underlying it? Do you think that this applies only in human parent-child bonding? Research this question and explain why or why not. One problem autistic people sometimes encounter is being too trusting because they do not recognize when someone is cheating them. Given findings in other studies that oxytocin facilitates trust in people even when they have experienced betrayal, how do you think these results might affect any effort to apply oxytocin therapeutically in autism? Malaria affects several hundred million people worldwide every year, and each year, more than one million people–mostly children–die of the disease. The vectors for transferring the plasmodium that causes malaria to humans are female mosquitoes from the Anopheles genus. To combat these mosquitoes and this deadly disease, we must first understand the mosquito nose. The mosquito sense of smell is localized to the animal’s antennae. There, nerve cells sense various odors (all smells are particulate!) via molecules of protein called receptors (because they “receive” the input). Scientists have reasoned that if they can understand which odors trigger these receptors–and thus, the mosquito’s interest–they may be able to develop odorants (smells) that distract the mosquito from people, thus reducing transmission of malaria. The labs of Dr. John Carlson of Yale and Dr. Lawrence Zweibel of Vanderbilt have respectively co-opted the fruit fly (Drosophila melanogaster) and a frog (species not specified) as their method of high-throughput production of these mosquito nose proteins. The fly approach is a bit slower, involving painstaking insertion of the mosquito genes into flies one at a time. The flies express the proteins in their own antennae, a replacement for their own receptors that have been knocked out. The frog egg approach is more truly high throughput, as the engineered frog eggs express an abundance of the mosquito nose proteins. The smell-sensitive egg then can be tested using a system that measures nerve signals: Whenever a specific odorant dissolved in the buffer solution surrounding the egg sets off the nose protein receptor, the system registers the electrical response. The flies are good for testing compounds that volatilize in air, showing by their behavior whether or not the odor attracts, while the frog eggs allow for a more truly high-throughput analysis. Together, they make quite a team when it comes to testing the mosquito’s sense of smell. The two labs tested each system using 72 receptors from the Anopheles “nose” and a panel of 110 odorants. The mosquito-nosed frog eggs and mosquito-nosed flies yielded results that pretty much matched: Some receptors are generalist types, reacting to just about any smell, but a special few focus more on specific odors. As it turns out, 27 of these receptors are fine-tuned to respond to the odorants in human sweat. The results from these studies are reported simultaneously in two papers, one in Nature and one soon to appear in the Proceedings of the National Academy of Sciences. Why go to all the trouble to make mosquito noses in flies and frogs? The hope is to use these high-throughput methods to identify compounds that can serve as decoys for the mosquitoes by deceiving these “nose” receptors. If researchers can identify an eau d’ sweat that distracts the mosquito away from a human target or an odorant combination that repels the mosquito from people, the outcome could be a decrease in transmission rates of malaria. UPDATE: Malaria does not distinguish between kings and commoners: News reports indicate that the microscopic plasmodium may have felled King Tut himself. Why do scientists focus on species like fruit flies or frogs (e.g, Xenopus laevis) when they do research like this? Why not use the species being studies instead? Do some research on the relationship between the malarial plasmodium and the mosquito. Do all species of mosquito transmit this pathogen? What distinguishes species that transmit malaria? The article references measuring electrical activity in the frog eggs in response to odorants. Look up “voltage clamp.” How is that used to measure electrical activity? World/public health question: What has been done in the past to combat malaria? How effective were these efforts? What is being done today? Some efforts are high-tech, like the studies described above. Some are low-tech. Can you identify a few examples of each? In a follow-up to the post below about communicating in a vegetative state, a new report indicates that the Belgian man whose alleged communications first opened the window to such studies may not have been saying what was attributed to him. Rom Houben made headlines around the world when researchers reported that in spite of his having been in a vegetative state for many years following a car accident, he appeared to be functioning at a level high enough to perceive and respond mentally to the world around him. In spite of the optimistic headlines, however, some observers expressed skepticism that Houben was doing the communicating. As just reported in Der Spiegel, follow-up testing to address lingering questions about the report seems to indicate that Houben likely was not formulating those responses himself. Instead, the speech therapist appears to have been doing the responding. While the physician conducting the original study said that he had already tested for this possibility, further, more stringent tests demonstrated that Houben lacked even the muscle strength to have typed the responses attributed to him. It is not uncommon in facilitated communication for the person doing the facilitating to unconsciously begin communication their own thoughts or perception of the patient’s thoughts. In spite of these findings, because of the results from imaging of activity of Houben’s brain, there is little doubt that he lives in some kind of consciousness. The imaging suggests a level of activity near that of a healthy brain. Also of interest is the fact that even though Houben didn’t pass the more stringent set of tests, another patient with a comparable diagnosis did. Thus, the quest to determine the magnitude of consciousness, perception, and response in patients diagnosed as “vegetative” continues. It’s not unusual for our domesticated familiars to have gone through several cycles of domestication. In the Old World, pigs and sheep and cows submitted to the process several times. But the New World has only a few examples of its own homegrown domesticates, and now, thanks to some fossilized poop, we can trace the taming of the turkey. Using coprolites–that’s the poop–and mitochondrial DNA, researchers describe in a study published in PNAS having nailed down the domestication of the turkey in the American Southwest. The previous idea was that the turkey was like beans, maize, and squash–it made its domesticated way to the Southwest by way of trade routes from southern Mexico. Indeed, in southern Mexico, indigenous peoples had domesticated their own version of the bird. But the southwesterners had their own version, too, and mitochondrial DNA–which passes from mother to offspring and accumulates mutations at a slow, predictable rate–shows that their turkeys came from a different species. You might think that the turkeys around today came from one or the other of these turkey lines, so carefully bred 2000 years ago. Nope. Europeans showed up, took some turkeys back to Europe. There, other Europeans produced some deeply inbred turkeys that then made their way via import back to the Americas. The turkeys we eat today, the ones that make the centerpiece around a Thanksgiving table or in a Sarah Palin interview, may trace back to southern Mexico, but they’re now really inbred European imports. Good thing Ben Franklin didn’t get his way when he allegedly proposed the turkey as the national bird for his fledgling nation. Why do you think mitochondrial DNA accumulates mutations more slowly than, say, nuclear DNA? Explain why mitochondrial DNA passes only from mother to offspring. How do you think the researchers could tell whether or not turkeys were inbred? Coprolites are trace fossils, while fossilized bones are body fossils. What are other examples of trace fossils? What can these trace fossils tell us in the absence of body fossil information?